But there's something strange about the firm they hire--more specifically, the quirky gentleman who arrives to supervise the project: Mr. Patoff, tall and thin and wearing a bow tie, and with an odd smile that never quite reaches his eyes. In his first interactions, the consultant asks a few inappropriate questions, and generally seems a nuisance. Over time, Patoff gains more power, to the point where he seems to be running the whole company. He enacts arbitrary and invasive changes to office protocol. He places cameras all over the building, making workers paranoid; he calls employees at all hours of the night, visits some of their homes and menaces their families. People who defy the consultant get fired… or worse. They soon realize they're not just fighting for their jobs: They're fighting for their lives. 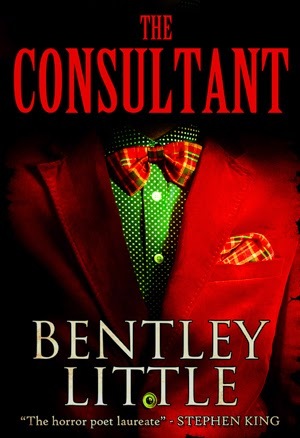 The Consultant is a biting workplace satire, with the horrific touches only Bentley Little could provide. Creepy idea. Hope my company never hires one. This actually sounds really creepy, but it's probably fun, too. I haven't heard of it before now. Nice pick! This definitely sounds like fun! Although Cemetery Dance, it will be hard to afford this book unless someone else is publishing a less expensive edition of it as well. This does sound like it could be quite fun! Hmmm... This one does sound good! Thanks for sharing :) By the way, if you're a horror fan I'm hosting a Horror Reading Challenge this year on my blog! I'd love it if you'd join us!! Gosh, this reminds me of my former manager.- and that is creepy enough. I would read this. Creepiness and all. I've never read this author, but from the book description it sounds like a quirky/creepy horror combo in a similar vein as Horrorstor. Could be good. Just finished an Advanced Review Copy. Nice to have a "Classic" style Little novel again. This one is absurdly funny but still manages to bring the chills. Lots of fun.